"The tone isn't breathing" complains pianist Pierre-Laurent Aimard, distraught. This is a typical sentence in Steinway & Sons' chief technician and Master Tuner Stefan Knüpfer's normal work day. Each piano has its own personality, each piece demands its own timbre, and every interpretation has a particular temperament. To find the right instrument with the necessary qualities, compatible with the vision of the virtuoso, to tune it to perfection and to finally get it on the stage, needs nerves of steel, boundless passion, and the extraordinary competence in translating words into sounds. Pianomania is an award-winning documentary (the film won Best Documentary at the 2009 European Film Awards) that takes the viewer along on a humorous journey into the secret world of sounds, and accompanies Stefan Knüpfer at his unusual job with world famous pianists like Lang Lang, Alfred Brendel, Rudolf Buchbinder, Till Fellner and Pierre-Laurent Aimard, among others. This unusual film by Lilian Franck and Robert Cibis tells – with love and humor – of moments of absolute love of attention to detail and perfection. Pianomania observes, from unique angles, the suspenseful search for the perfect tone. 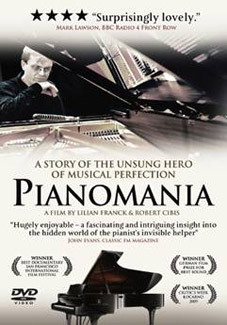 Pianomania will be released on UK DVD on 14th November 2011 by Crabtree Films at a to-be-confirmed price. No extras have been detailed as yet.